Gardening affects gardeners more than we know. It has to do with the omnipresent nature of topography, I suppose, the inescapable imposition of landscapes. Few hobbies offer such an affront. An avid golfer doesn’t drive to work and think, “Gee, noticing this stretch of road and the bend ahead, I wonder if I could just tail a four-iron to exactly follow the pavement.” Fly-fishing fanatics don’t revel in the thrill of their sport when out walking the dog. We garden the planet Earth. The thirst for knowledge that is gardening, and the aesthetic opinions that this knowledge imprints, automatically kick in every time we view the outdoors. It kicks in hardest for me when I travel to north Ontario, from where I recently returned. In the final week of May it’s cold on this granite island three miles down the Winnipeg River from the tiny bush town of Minaki, Ontario. It has been cold all spring. We get in late, across deep, black water, to a forty-one-degree cabin, so the first duty is a roaring fire. It barely knocks the chill from the air. I have forgotten soup, the customary first supper, remembered hotdogs, but forgotten bread, and ketchup. So we dine, near midnight, a hotdog bare on a paper plate, Ovaltine, a banana, Rugrats fruit snacks for desert. I snuggle under a thousand blankets and sleep as I only do in Ontario, deep, effortlessly, and without dream. The next morning at sunrise I walk the woods and cliffs and shorelines and at first am disappointed by what I see, or fail to see. Spring has barely arrived, and few wilderness flowers are in bloom. Last year at this time it was eighty-two degrees, and everywhere you looked there was color. Carpets of white curled through the woods, the baton traded between Nodding Trillium (Trillium cernum), Bunchberry (Cornus canadensis) and Star Flower (Trientalis borealis). The pink-purple petals of Wild Geranium (Geranium maculatum) edged nearly every portage and path. Trout lilies (Erythronium americanum) shown their bright yellow faces atop elegant, slender stems nearly anyplace a fallen tree or rich depression cast enough soil to support life. I didn’t have my camera. Now as I walk I’m already thinking of ways to juggle my duties and commitments at home in order to sneak back up here in two weeks. But wait. Here’s something. 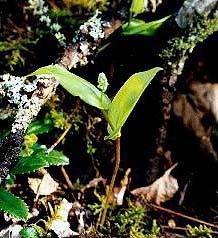 A lone Wild Lily of the Valley (Maianthemum canadense) greets me just as the sun begins filtering through a swath of aspen and pine forest. These things don’t grow alone, there will be hundreds, thousands of them here soon, but this one is apparently a real go-getter. The white flower buds have formed but not opened; still, the plant is perfect sculpture. From the elegant, subtly twisting, copper-colored stem float two leaves held in effortless balance, though the bottom one is larger. The tiny, clustered flowerhead is poised exactly in the middle of the line the eye draws between the tips of the two leaves. The visual weight, the angles, the scale of every component of the plant is perfect. It’s fantastic art, effortlessly flaunting the design principles flower arrangers hone during a lifetime. Over the next six days, it remains the only one I see. 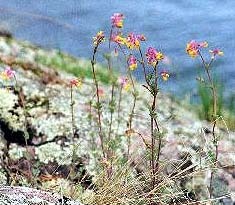 Then on a rocky shore I am greeted by waves of Pale Corydalis (Corydalis sempervirens), nodding clusters of pink flowers tipped with yellow, bobbing and weaving in the wind like bobble-head dolls. 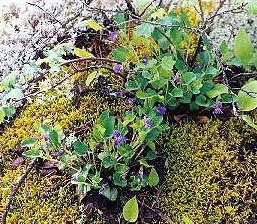 On the same shore I find Great-Spurred Violets (Viola selkirkii) in abundance, and once I see them I see them everywhere. 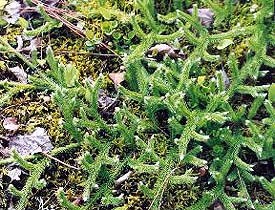 They grow in clumps out of moss-covered granite, there is no soil to speak of, yet have survived this region’s Zone 3 winters for thousands of years. Now that’s a perennial. Soon I realize that since this is such a late spring, I’ve never been to Ontario this early in the season. For the first time I see moss in bloom — or is it past bloom? Singular, threadlike, reddish stems hold pale green pods two inches in the air. Slicing one open I see it holds seeds; so it is past bloom. How long has moss been on the planet? A million years? Who knows? One thing is for certain, it sure gets an early jump. The early jump I’ve made this year is proving to hold some advantage. Not thirty feet from the cabin I spy a sprawling, amazing groundcover I have never seen before — it becomes hidden later in the season. Needle-like leaves of the softest green are tipped in white along spreading branches that measure five feet out from the mother plant. Is it Crowberry (Empetrum)? I wish I could see it in bloom, if it blooms per se. If the nursery industry ever got their hands on this it would fly off the shelves. Hopefully, like so many plants up here, it won’t grow in anything resembling friable soil, and will remain a wilderness secret. Temperatures rise as the week progresses, and on our final full day we embark early for a lengthy fishing trip to the Dalles. 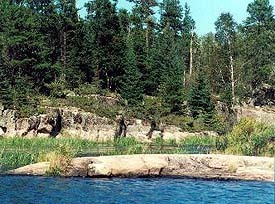 The Dalles is a slim granite chute fifteen miles upstream where the entire Winnipeg River is rammed into two narrow channels. The water is very high this spring, and as we near the Dalles the current causes the water to roil. We catch nothing but perch, and no matter where we fish, in the current, off the current, in shallow bays, off deep and shallow reefs, I cannot find a walleye. The more I fish in Ontario, it seems the less I know about fishing. The sun is warm, the wind has ceased, and a few miles downstream from the Dalles we go ashore to stretch our legs and have a look about. I have landed on one of fifty islands I might have chosen. This one is particularly out of the way, as we had been miles off the main channel, fishing in bays. I should point out that the Winnipeg River is not a river in the classic sense. It is a nearly infinite, granite-lined maze of islands, points, hidden lakes, channels, and bays, all flowing North, where its waters will join the mighty Nelson River and finally dump into the Hudson Bay. The only reason I chose this island was that it had a tuft of brush rising from a V-shaped patch of soil at the shore, where I could nose in and tie my boat. It’s a small island, about an acre, a granite crown tufted with birch, spruce, red and white pine, junipers, grasses, and a dozen varieties of mosses. My son Elliot disappears over a granite crest, excited to be free from the confines of the boat and the boredom of lousy fishing. Soon he gives a shout. Though only ten, I rely on him as my chief flower-spotter. “Dad, come look! Really weird! Really cool!” I follow his voice to the other side of the island and as I approach I see them. 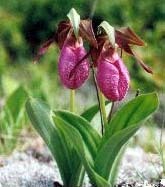 There they are, there’s the prize, the jewel, one of the neatest catches you’ll find in the northern wilderness: Cypripedium acaule, the Pink Lady’s-slipper, or Moccasin flower. 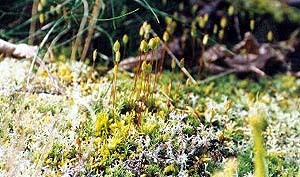 Before me is a clump of two, rising like royalty from the brittle white moss. Then another two, then a clump of six, and over there, eight. How many years has it been since a human has stood here and been silenced by their beauty? Ten? A hundred? Ever? No matter; they bloom just for us this year, for there is no chance another angler will happen on them before their mesmerizing blooms fade, in just a few precious days. We arrive in late afternoon to the cabin, to discover it has been under assault since moments after we left at dawn. Armyworms (Pseudaletia unipuncta) are everywhere, everywhere. The dock, the deck, the screen doors, every tree and shrub on the way up to the cabin, on the clothesline, the woodpile, the water tank. 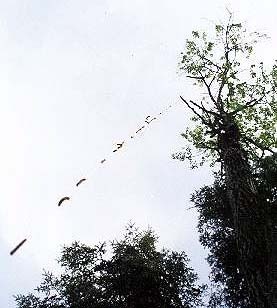 They broke with today’s heat, and as I look up I can see hundreds of them rappelling down from the trees. The next morning they are so thick around the cabin you can hear them. Though they prefer the deciduous leaves of aspen, they have already defoliated pretty much everything they’ve landed on, including young pine. Walking around the cabin as we prepare to leave we swing sticks back and forth like swords, yet still come inside covered with worms, and their silk. And I leave them to it. This is their gig; I’m just a freeloader. Across northern Ontario the aspen are going to get clobbered, and many will die out, leaving open spaces for the young spruce and pine to flourish. I’ve seen the cycle twice in my forty-four years. While I’m alive or well after I’m dead, a fire will clear out the pine and that next spring the aspen will again take command. It has happened many times, over thousands of years, and there is no reason for me to react. My little blip of breath in the context of the lifetime of this wilderness is of no greater importance than the life of the beaver in the next bay. I return to civilization, to deadlines, to phone messages and in-boxes, again reminded that my petty concerns and exaggerated needs are childish and ephemeral. There is no need to return in two weeks, I have seen what I need to see. I will wait and return to Minaki in August, and am quite looking forward to it.